Synthesized peptide derived from the Internal region of human IL-21. Small volumes of anti-IL-21 antibody vial(s) may occasionally become entrapped in the seal of the product vial during shipment and storage. If necessary, briefly centrifuge the vial on a tabletop centrifuge to dislodge any liquid in the container`s cap. Certain products may require to ship with dry ice and additional dry ice fee may apply. 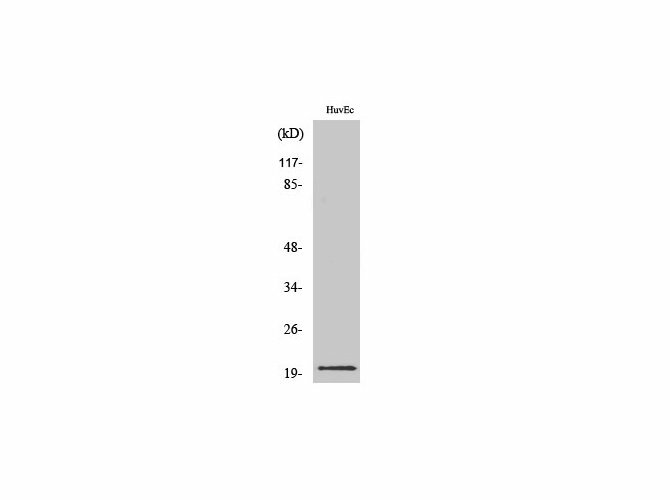 Western Blot analysis of various cells using IL-21 Polyclonal Antibody at dilution of 1:500. NCBI/Uniprot data below describe general gene information for IL-21. It may not necessarily be applicable to this product. IL21: Cytokine with immunoregulatory activity. May promote the transition between innate and adaptive immunity. Induces the production of IgG(1) and IgG(3) in B-cells. May play a role in proliferation and maturation of natural killer (NK) cells in synergy with IL15. May regulate proliferation of mature B- and T-cells in response to activating stimuli. In synergy with IL15 and IL18 stimulates interferon gamma production in T-cells and NK cells. During T-cell mediated immune response may inhibit dendritic cells (DC) activation and maturation. Belongs to the IL-15/IL-21 family. 2 isoforms of the human protein are produced by alternative splicing. 1. IL-21 has multiple effects on Natural killer cell development and functions.